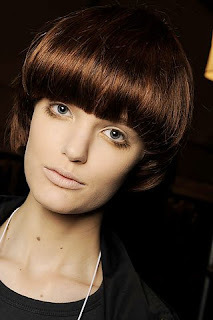 Forget top lashes ... or at least that's what happened at 3.1 Phillip Lim during Fall 2009 Fashion Week. Because rather than loading the top lashes with mascara, they were left bare. Never fear, though ... the bottom lashes were shown quite special treatment and accented to the fullest! Paired with minimal makeup, the bottom lashes were longer, thicker and lusher than the top lashes at quite a few of the shows this season. What do you think of this look? Should the bottom lashes have been left alone, or would you rock this? Let me know in the comments! wow, great story. the look could really take off. I think it's cool!